In the expanding town of the 1840s, it was thought desirable to replace Bridgend’s old town hall, which stood on arches over the marketplace, with a new building large enough to hold public meetings and courts. Designed by a Swansea architect named Rayner, the building was erected on land donated by the Earl of Dunraven and is reported to have cost £1,450. The Justices of the Peace of the County of Glamorgan contributed £300 so that the basement storey could be fitted out as a Police Station House, while the remaining sum was raised through voluntary donations. A foundation stone was laid on 13 September 1843 by the Rt Hon John Nicholl, MP for Cardiff, and HM Judge Advocate General, and the completed building was handed over to the subscribers on 1 May 1845. The major internal space was a hall measuring 65 x 38 feet. The building was used for a variety of purposes – court hearings, banquets, concerts, dramatic performances, political meetings and meetings of the townspeople. When Glamorgan County Council was established in 1889, the County Surveyor’s office was initially based there. The changed pattern of society after the Second World War robbed the building of much of its usefulness. As a result, the structure fell into disrepair. Despite a ‘Save the Town Hall’ campaign, it was demolished in 1971. ‘The Town Hall Fund’ remains active as a charitable trust. It administers income from the proceeds of the Town Hall’s sale, which may be applied for charitable purposes for the general benefit of the inhabitants of Bridgend. During the five years 2009 – 2013, it generated an average annual income of around £570. I propose making Bridgend the Station House for this District and the residence of the Superintendent… Bridgend being the central point it is highly desirable that a good station house should be erected, I would suggest that the building should contain a residence for the Constable, with offices for the Superintendent, and four cells [Record of the General Quarter Sessions of the Peace for the County of Glamorgan, held at the Pyle Inn on Monday 30 August 1841, ref. : DMM/CO/71]. Although it was agreed that a new Police Rate of £800 be raised specifically to fund the Constabulary, it was recognised that it would take time for suitable premises to be built in all areas. The situation in Bridgend was not addressed fully until 1845. The Glamorgan Archives holds the original plans for the new police station built at that time and much of the background correspondence dealing with the negotiation for its construction. The news, in 1843, that plans were afoot to build, through private subscription, a new town hall in Bridgend on land owned by the Earl of Dunraven presented an opportunity for a police station, cells and court room to be incorporated within the design. A Committee of Magistrates had been established to oversee the building of police stations for the Constabulary. When this committee was approached, in 1843, by the group charged with the construction of the Bridgend Town Hall, it was soon agreed that facilities for the police and local magistrates could be provided in the basement of the Town Hall. The details of the arrangement agreed at that time are set out in the Record of the General Quarter Sessions of the peace held in Neath on 27 June 1843, held at the Glamorgan Archives. That, save such as may be included under the head of ‘County Meetings and duly convened’, it shall not be used for any meeting of a political party, polemical, or controversial character or complexion [Record of the General Quarter Sessions of the Peace held at Neath on 27 June 1843, ref. : DMM/CO75/2]. 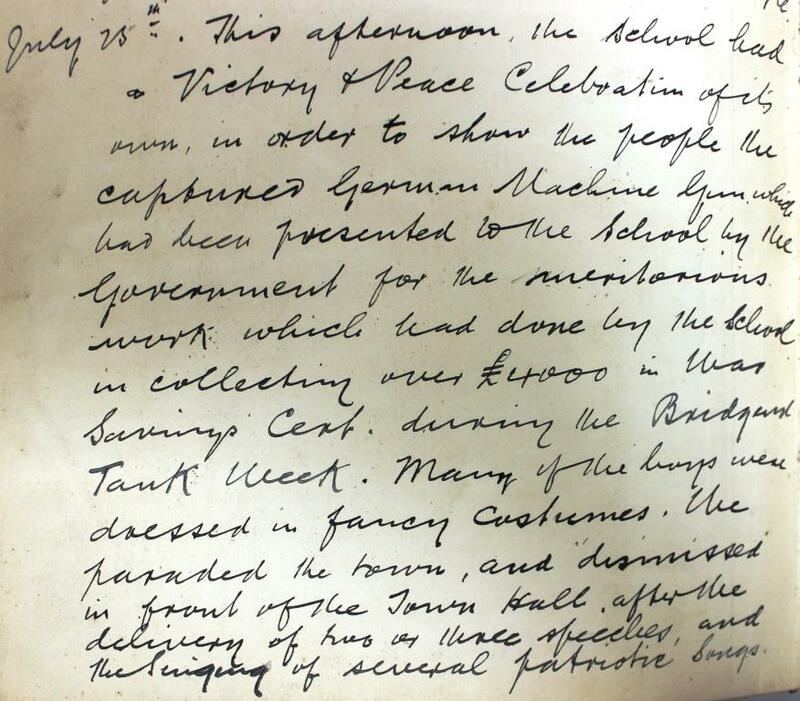 The last provision, relating to political usage of the Hall, was kept in place for 40 years and only rescinded by agreement of the management committee in May 1885 [Bridgend Town Hall Minute Book, 1845-1941, ref. : DXS/1, p103]. The original plans for the basement, drawn up by the architect, D Vaughan, can be seen at Glamorgan Archives. The plans carry a wax seal and they are signed to confirm that they had been approved by the Secretary of State at the Home Office, Sir James Graham, on 8 August 1843. Given that the town of Bridgend was policed by only one officer, the space allocated to the Glamorgan Constabulary was quite sparse and consisted of one bedroom, 12ftx12ft, a store room of similar proportions and a living room with a fuel store, 14ft by 17ft. In addition, three cells were provided, each 10ft by 6ft. Napier had commented that where cells were provided across the county they were often unheated and unsuitable for use in the winter. To address this, provision was made for the cells in Bridgend to be heated by flues from fires in adjoining rooms. Each cell also had a water closet. Much of the rest of the ground floor was allocated for use by the Magistrates of the Hundreds of Newcastle and Ogmore with provision of a Magistrates’ Room and a Court Room. Although it is not stated, the basement would have been lit at night by oil lamps given that the Town Hall was not fitted with gas lights until 1847 [Bridgend Town Hall, ref. : DXAG]. Copies of the declaration of Trust and lease for the station house, made in August and October 1844 respectively, are also held at Glamorgan Archives. They confirm that the construction of the building took just over a year. The foundation stone of the building which was erected by public subscription, was laid on the thirteenth day of September 1843, by the Rt Honorable John Nicholl, MP. Her Majesty’s Judge Advocate General and the Hall, having been completed, was delivered up to the subscribers by Mr John Rayner of Swansea, the Architect, on the first day of May 1845 [Bridgend Town Hall Minute Book, 1845-1941, ref. : DXS/1]. By and large the facilities were in line with Napier’s recommendations, with provision of accommodation for the local constable, for which rent would have been deducted from his pay. However, only three, rather than four, cells were provided. The New Town Hall was handed over to the Trustees in May 1845 with the first meeting held in the first week of June. A small amendment to the station layout was made in 1848 to provide stairs from the station house to the prisoners dock in the hall. The plans for this are also held at Glamorgan Archives with confirmation that they had been approved by Sir George Grey, the Home Secretary, on 2 September 1848 [Glamorgan Constabulary Records, Bridgend Town Hall, 2 Sep 1848, ref. : DCON236/1]. Bridgend Station House. It was stated that the rooms of this station smoked very badly – that the chimneys did not draw well… After a short conversation upon the subject… it was ordered that steps should immediately be taken for the purpose of lessening, if not entirely removing the evil complained of by the inmates of the Bridgend Station House [Cardiff and Merthyr Guardian, 5 July 1845]. At all events he thought the county had received a good shilling’s worth for a shilling in having a station house which cost £500 for £300. (Hear). [Cardiff and Merthyr Guardian, 5 July 1845]. Whether the inhabitants of Bridgend were pleased with this assessment was not recorded. Christmas is traditionally a time when we think of others and when charities launch special appeals to raise funds. During the First World War this was even more important with so many soldiers and sailors serving overseas, separated from families and home comforts. School log books record the charity fundraising efforts of the pupils. At Gellidawel School in Tonyrefail in October 1914, the Headteacher recorded sending a £1 postal order to HRH Princess Mary for her fund to provide Christmas gifts for servicemen. The teachers had provided the prizes and there was a prize draw amongst the children, who paid a penny for each ticket [ELL26/2]. One Headteacher in Pen-y-bont School, Bridgend [EM10/11] wrote wearily in October 1914 that, due to the war and the many calls …it has entailed upon the pockets of the people…, he had not had …the face this year to beg for subscriptions… to the Christmas Prize Fund. However, funds were raised for servicemen and a sizeable sum of over £7 was sent to the Prince of Wales Fund. It was used to purchase cigarettes, woollen mufflers and chocolates and sent to Old Boys stationed in Scotland. He records having received a thank you from Sergeant Major Miles thanking the boys for …their Happy Christmas Box [EM10/11]. Refugees from Belgium were not forgotten at Christmas. The Headteacher of Dyffryn Mixed School in Ferndale, recorded that money had been raised for the refugees by pupils collecting on Christmas Day in 1916 [ER15/1]. 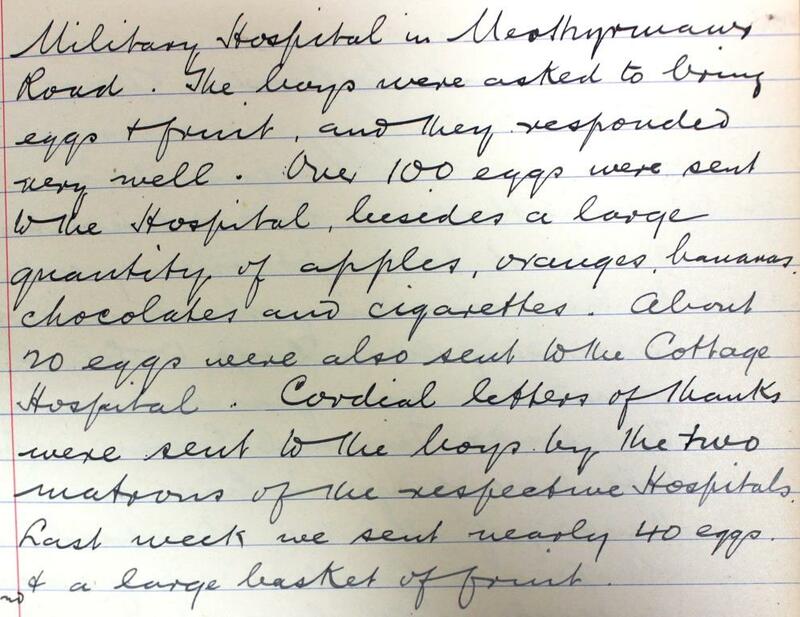 The minute book of the Rest Convalescent Home in Porthcawl also records help given to Belgian refugees; …that the matter of providing extra diet etc. for the refugees and staff at xmas be left to matrons and chairman… [DXEL/3/5]. Concerts were arranged to raise funds. Mr Leon Vint applied for a licence from Barry Council to open ‘Vint’s Place’, Thompson Street in Barry on Christmas Day in 1914 and 1915, with performance profits to go to the Barry Red Cross Hospital. 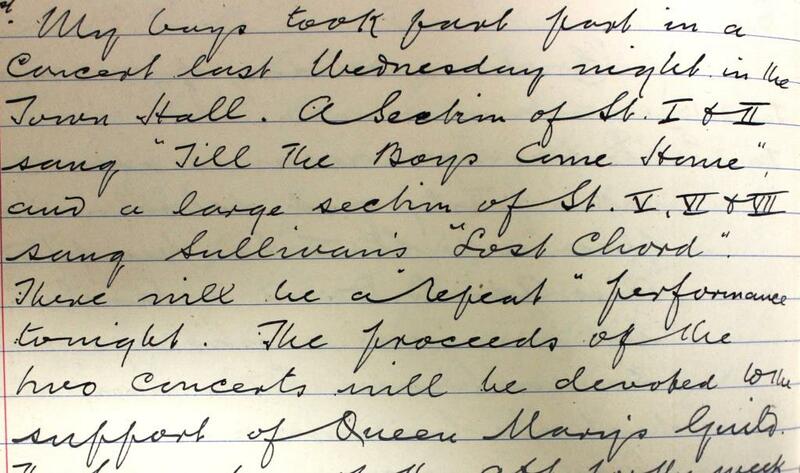 Romilly Hall was also to be allowed to open on Christmas Day for the same purpose [BB/C/1/20,21]. As well as raising funds, the opening of venues on Christmas Day meant that servicemen could be entertained. Cardiff Borough Council gave permission for the Central Cinema, The Hayes, to be used on Christmas Day between 5.30 and 8pm for the …purpose of free entertainment for servicemen [BC/C/6/54]. Mountain Ash Urban District Council proposed a Sunday Concert at Abercynon Palace on 29 November 1914, …the proceeds to be devoted to the making of, and sending a huge Christmas box of cigarettes, tobacco, socks etc to the soldiers at the front [UDMA/C/4/12]. In 1916 The Daily Telegraph and Daily News were entrusted by the War Office to raise funds for providing Christmas puddings for soldiers at the front, and local councils raised funds to send to the charity. 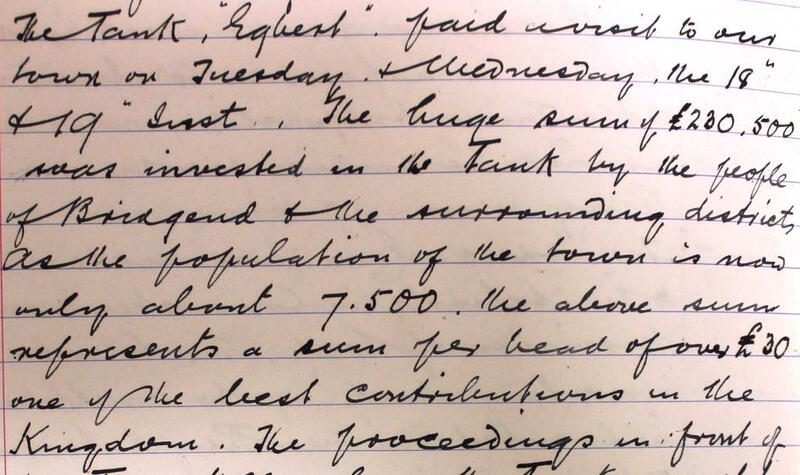 Porthcawl Urban District Council sent over £7 to the ‘pudding fund’ in 1916 [UDPC/C/1/10]. Local parish councils, churches, chapels and other organisations also sent morale boosting Christmas parcels to local men serving abroad. Amongst the records of the Cardiff University Settlement are letters of thanks from soldiers for parcels received at Christmas. On 19 December 1916, Gunner C Upcott writes to Edward Lewis, I beg to thank you and all the members of the University Settlement for their kindness in sending me the parcel and I do not know how much to thank you for your kindness. It is something terrible out here with the rain and one thing and another but I hope the end won’t be long so as we can all meet once again (DCE/1/64). Private William Slocombe of Cardiff, who was awarded the Military Medal during the War, wrote to his mother, from the front, on 9 December 1916. He asks her to buy him a …soldier’s diary… which has …a lot of useful military information and a small French dictionary at the beginning… I should like you to send me one if possible. It does not cost more than a couple of shillings at most. He is also thinking of Christmas gifts for his family at home and sends a postal order for 10 shillings; It is for the kids and yourself… If you can get some chocolates for the girls so much the better. I should like to give Pa some tobacco too’ Poignantly he writes …the circumstances are very different to last year aren’t they? Your affectionate Son… [D895/1/3]. These records, and many more relating to the First World War, are available to consult at Glamorgan Archives. The nine days of the General Strike in May 1926 shook the foundations of British society as over 1.5 million workers across the country downed tools. For many in the trade union movement it was a simple act of solidarity with the miners who had seen their wages and terms and conditions progressively driven down in the years following the end of the First World War. It is estimated that, by 1926, miners’ pay had fallen by a third from the 1919 levels. Proposals to further reduce wages and extend the working day produced the famous response from the Miners’ Federation of Great Britain, ‘Not a penny off the wages and not a minute on the day’. The decision by the TUC, in May 1926, to call out the transport workers, printers and iron and steel workers in sympathy with the miners met with almost total support from the unions and their members across the country. In other quarters the TUC’s decision was seen as a General Strike and a challenge to constitutional government. With the shock waves from the Bolshevik revolution in Russia still fresh in the memory, the Prime Minister, Stanley Baldwin, called the Strike ‘a challenge to Parliament’ and ‘the road to anarchy and ruin’ [The British Gazette, 6 May 1926]. Well before the strike was announced, the Government had preparations in hand to maintain key services across the country to be run in each area by a centrally appointed Civil Commissioner. In South Wales, the Earl of Clarendon was installed on May 2 1926 in Dominions Building in Cardiff to work with the local authorities to maintain law and order, transport and food supplies. He also had at his disposal the local arm of the Volunteer Service Committee established to recruit local men and women to keep the docks and local transport services operating and, if needed, bolster the police force. In all, the local Volunteer Service Committees recruited over 12,000 volunteers in South Wales. Small numbers of men were used to provide a skeleton service on the railways and in the docks . The impact of the volunteers was perhaps most evident in urban areas and, in particular, in Cardiff, where they were used to run tram and bus services. Although the TUC urged its members to avoid confrontation, the Government was determined to maintain essential services and stationed troops in most cities and towns along with naval vessels in key ports. Glamorgan Archives holds material that tells the story of the General Strike in south Wales from the perspective of the unions, local volunteers and those running the Volunteer Service Committees. Records, such as the school log books, also trace the impact on local communities. Mr Churchill pointed that either the nation must be mistress in its own house, or suffer the existing Constitution to be fatally injured, and endure the erection of a Soviet of Trade Unions with the real effective control of our economic and political life. The Chancellor, however, foresees the nation’s triumph in the struggle. ‘No one’, he declared, ‘can doubt what the end will be, but from every point of view, including our duty in the interests of the working classes of this country, we are bound to face this present challenge unflinchingly, rigorously, rigidly, and resolutely to the end’ [The British Gazette, No 1, Wednesday 5 May 1926, DX24]. The Government had put in place detailed contingency plans for the maintenance of essential services in the event of a strike. The first edition of the British Gazette contained details of the Civil Commissioners appointed at a regional level across the country, with the Earl of Clarendon charged with south Wales. Based at Dominions House, Queen Street, Cardiff, his remit was to work with local authorities to maintain law and order and the provision of essential services, in particular transport and supplies of coal and food. The Civil Commissioners also had at their disposal a local Volunteer Service Committee chaired by a Government nominee and set up specifically to recruit volunteers to keep essential services running. In some instances the basis of a volunteer force had already been put in place by a body known as the Organisation for Maintenance of Supplies. The OMS had originally been created in response to a campaign led by The Times in 1925 for the establishment of a voluntary body, with branches across the country, ready to recruit volunteers in the event of a general strike. Although not officially a Government agency, Volunteer Service Committees, often supported by the OMS, played a key role in helping the Civil Commissioners maintain key services. Edward Loveluck was a local architect from Bridgend who worked for the Volunteer Service Committee in May 1926. His papers illustrate the extent to which the Government was both determined to break the strike and had taken steps to put detailed plans in place to counter the strike in the run up to May 1926. 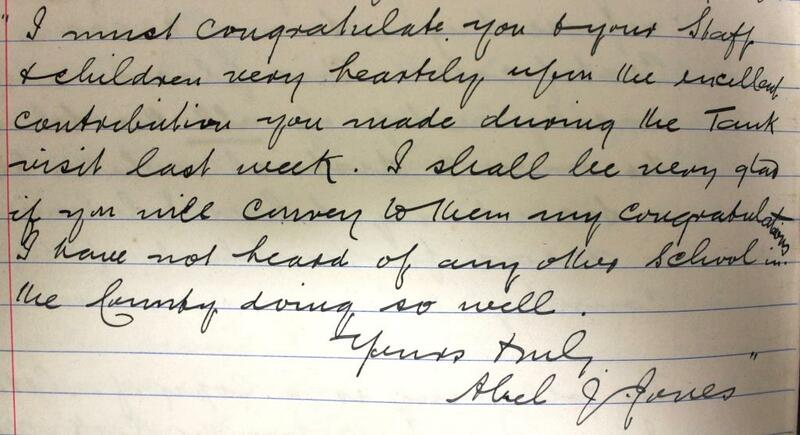 On 22 April, two weeks before the strike was called, Illtyd Thomas, Chairman of the Cardiff Area Volunteer Service Committee, wrote to Loveluck headed ‘Secret and Confidential’, asking him to act as Vice Chairman with responsibility for the Bridgend District. Thomas’ letter confirmed that planning for service provision in the event of a General Strike was in full swing. The last line was to be the subject of much controversy for there was clearly a fine line between the use of volunteers to run services where union members were on strike and strike breaking. It was clear that the Volunteer Service Committees were seen as an integral part of the machinery being put in place at the local level to counter the strike. In a second letter, dated 3 May, Thomas provided Loveluck with a copy of a confidential Government Memorandum setting out how the Volunteer Service Committees would support the Civil Commissioners and their staff. It also contained details of codes that would be used during the strike to initiate, suspend and end action. The memorandum provided, as an appendix, a suggested format for a recruitment poster and a template for a Registration Card to record the details of volunteers. Although the posters were not to use the Royal Arms or the letters ‘OHMS’, it was clear that the committees were seen as a key agent in rallying public support for the Government in countering the strike. The records produced by Loveluck for the Bridgend area show that, within days, he was able to recruit over 180 volunteers. It is often thought that the volunteers came primarily from middle class, white collar occupations that had little sympathy with the unions. To an extent the records bear this out with a number of solicitors, accountants and surveyors in the ranks of the volunteers. However, the volunteers also included large numbers of labourers, drivers, blacksmiths and gardeners. Given the origin of the strike it perhaps surprising that several gave their occupation as collier, collier’s labourer, tram driver and loco driver. The ages ranged from the 16 year old bus conductor to the 72 year old man from Southerndown willing to help with transporting food and coal. The records suggest that, while the strike was widely supported in mining areas, in the towns and cities the population was deeply divided. There was certainly no shortage of recruits, both men and women, ready to help with clerical work, deliver supplies by road and even to work on the docks and railways if required. After assessing the volunteers, Loveluck produced a summary of the skills that could be provided by the second week of the strike. Perhaps a surprising factor was the small number coming forward for work as special constables given that there was a significant campaign in the Cardiff area to increase police numbers. However, it is possible that the need for additional police was less pressing in areas such as Bridgend, Southerndown and Porthcawl. The volunteers also included 13 women, one of whom was Edward Loveluck’s wife. Most offered clerical or canteen work although some were prepared to help with transporting food and supplies. 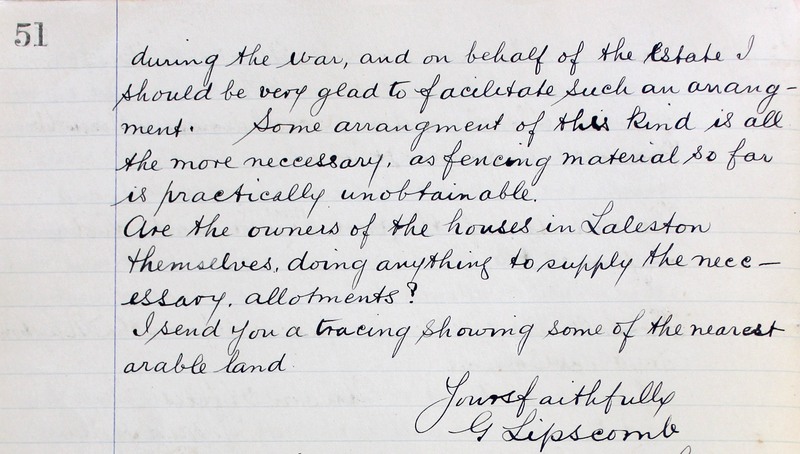 In his letter to Illtyd Thomas of 14 May, Loveluck confirmed that the measures put in place were working smoothly as the strike moved into its second week. There is nothing calling for special mention [Edward Loveluck to Illtyd Thomas, 14 May 1926, DLOV148]. By this time the strike was all but over with the TUC’s call for all but the mining unions to return to work. 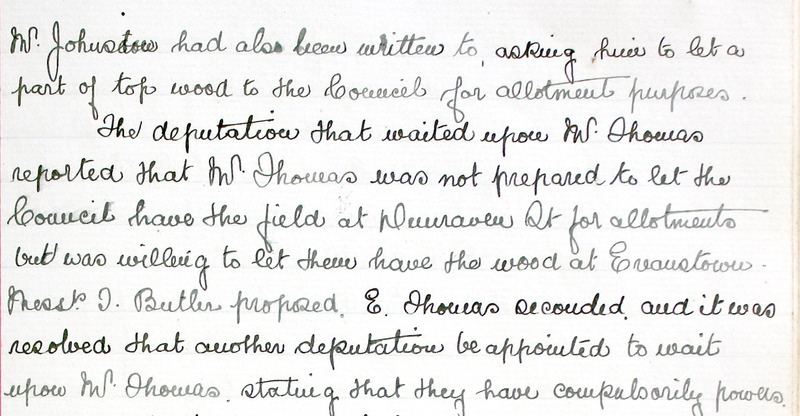 Four days later Thomas wrote to Loveluck confirming that his volunteers could stand down. Instructions have now been sent from the Chief Civil Commissioner that all Recruiting Offices should be closed and the services of staff ended but I should be glad if the individuals who so kindly helped should remain available in case it may be necessary to re-open offices at short notice. All records and accounts should be preserved including registration cards until further notice [Illtyd Thomas to Edward Loveluck, 18 May 1926, DLOV148]. There is still much debate as to precisely why the TUC called off the strike on 12 May. There is no doubt, however, that the work of the Volunteer Service Committees and men such as Edward Loveluck played a significant role in persuading the TUC that, at both local and national levels, the Government was a determined to resist the strike and there was no certainly that further strike action would be successful. With the outbreak of the First World War, many men signed up to serve their country, either voluntarily or because they were called up by the military. Local authorities were affected by this as much as any other field of work. Naturally those who had stayed behind and continued to work with the local authorities were keen to find out how those who were at the Front were getting on. Good news came from the Front in the form of awards bestowed on soldiers for their actions in combat. In September 1915, Gelligaer Urban District Council noted that James Green had been recommended for a Distinguished Conduct Medal. In December 1917 Private Tudor Lewis received the Military Medal. And on New Year’s Day 1918, it was announced that Sergeant Ivor Jones had won both the Distinguished Conduct and Military Medals. Several other employees were recognised for their distinguished service and bravery. In January 1917, Porthcawl Urban District Council heartily congratulated Lieutenant Tamblyn and Corporal Nicholls who had both been awarded for conspicuous bravery while on active duty. And in July of that year Maesteg Urban District Council congratulated Sergeant Fred Davies who had received the Distinguished Conduct Medal (DCM). 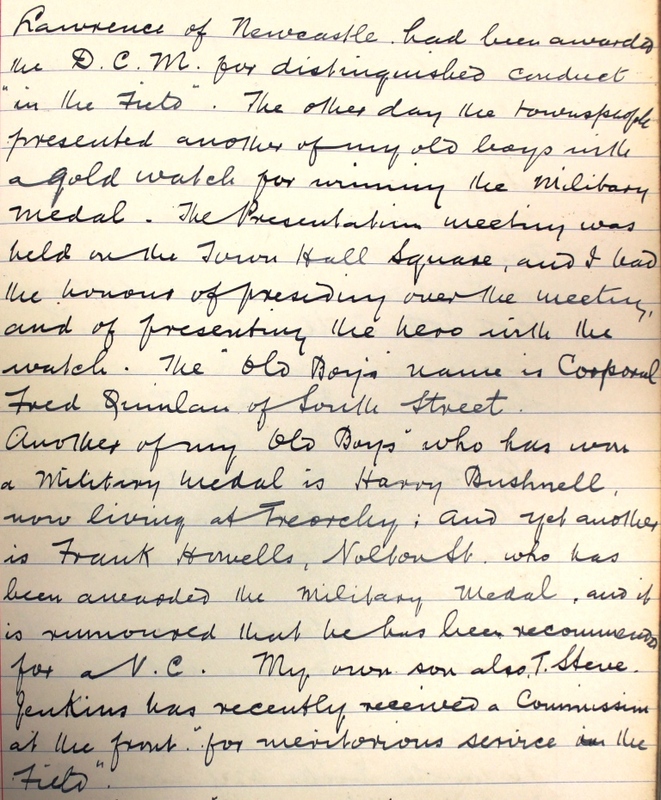 In June 1917 Bridgend Urban District Council passed on their congratulations to the parents of Oscar Powell and Frank Howells who had both received the Military Medal. In December of that year Second Lieutenant Steve Jenkins, son of one of the council members was also awarded the Military Medal. In January of 1918 Ogmore and Garw Urban District Council reported that Mr King, a former Captain of the Nantymoel fire brigade had received the Distinguished Conduct Medal. At the end of the War in November 1918, Aberdare Urban District Council revealed that Major R D Williams, the son of a councillor, had won the Distinguished Service Order. Another source of good news would be when servicemen were promoted. In June 1916 Bridgend Urban District Council congratulated Lieutenant Colonel F W Smith on his promotion to the Command of the 16th Welsh (Cardiff City) Battalion. In May 1917 Gelligaer Urban District Council reported on the rapid rise of Mr Emlyn Evans. Starting as a Private in September of 1915, he became a Lance Corporal in November of that year, then a full Corporal a month later. Six months after that he became a Sergeant before becoming a Company Sergeant Major in December of 1916. The following month he transferred to the Royal Flying Corps and became a Flight Sergeant and then in April of 1917 he became a Sergeant Major. Sometimes just hearing the news that someone at the Front was alive and well was enough cause for celebration. In September 1914 Penybont Rural District Council congratulated Colonel Turbervill on the news that his son Captain Turberville was in good health. However sadly, in May of 1915, Colonel Turbervill’s grandson was killed in action. Along with the joy of hearing of colleagues receiving awards for valour, there was also the despair of hearing the news of the death or wounding of those serving at the Front. In September 1914 the Earl and Countess of Plymouth lost a relative, Archer Windsor Clive. Several local authorities voted to pass their condolences, which were followed up by replies of thanks in kind from the Plymouth Estate. In November 1914 Penybont Rural District Council conveyed their sympathy to Colonel Nicholl on the death of his son Lieutenant Nicholl. In December, Mountain Ash Urban District Council expressed their condolences to the family of Lord Aberdare, whose eldest son had been killed. In October 1915, Porthcawl Urban District Council proposed a vote of condolence for the families of Lieutenant Sydney Randall Jenkins and Sergeant Evan Rogers. In November 1916 Dr M J Rees, who had been for many years the medical officer of health for Aberdare Rural District Council, was reported killed in action. In July of 1917 three former employees, Motorman Amos, Motorman E Wiltshire and Conductor AC Sims, were killed in action. In December 1917 Maesteg Urban District Council experienced a triple loss, with the deaths of Second Lieutenant Hugh Grade, Private Harold Edwards and Private Charles Corbett. Another triple loss was announced at the end of the war, with the deaths of Privates Ivor Evans, A Meldrum and Hillman. Not all losses occurred at what most people would view as the ‘Front’, namely France and Belgium. Some of the above losses may have occurred in other parts of the world. The Gallipoli campaign of 1915 saw British Empire troops serving in modern day Turkey, while several campaigns took place in both Africa and the Middle East. It is also worth noting that not all losses occurred on the ground. There were those who served in the air with the Royal Flying Corps (later Royal Air Force) and Royal Naval Air Service (later Fleet Air Arm), and there were those who served with either the Marines or the Navy. One loss at sea was in October of 1914 when Gelligaer Urban District Council reported the death of Lieutenant Commander McGregor when HMS Hawke was sunk by a German U boat in October of 1914. The local authority minutes at Glamorgan Archives show us that news from the front was highly sought after by councillors and employees. Although good reports were hoped for sadly it was often bad news that was received. The raising of £4000 amounted to approximately £12 per pupil – a massive sum in 1919. In addition, the money raised for Tank Week was just one element of the work undertaken by the Penybont Boys during the war years. 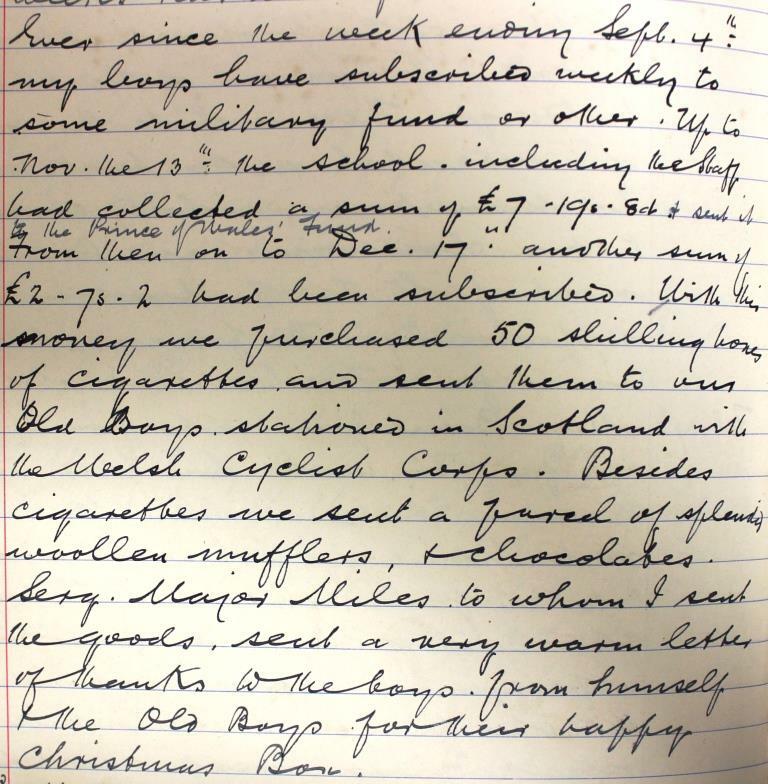 John Jenkins’ log book, held at the Glamorgan Archives, records the remarkable effort made by the boys and staff of the Penybont Boys’ School from August 1914 onwards to raise money and support the war effort. The recommendations of the 1909 report with regard to classroom accommodation, direct access to the playground, heating and the provision of hoppers for the lower sections of the windows have still to be carried out… The two small classrooms are still habitually overcrowded. 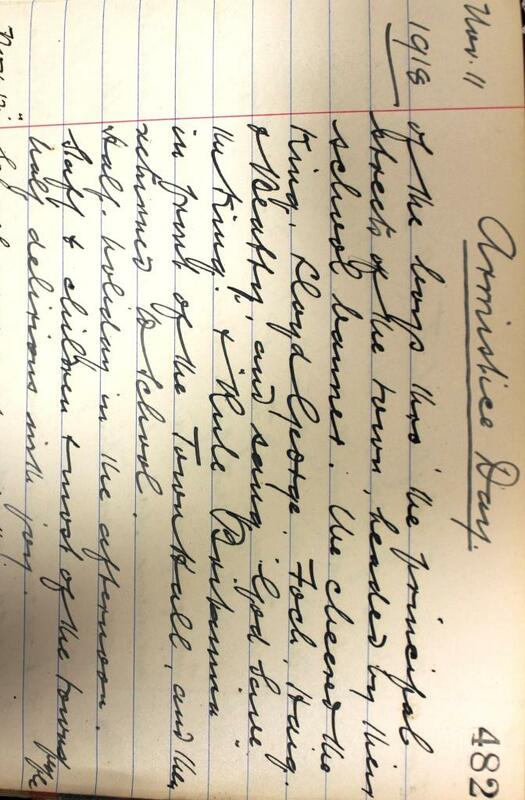 Several windows panes were broken at the time of the visit (Penybont Boys’ School,, log book, 24 Apr 1914, EM10/11 pp.365-68). The Department is staffed with energetic teachers… A very good scheme of work has been planned and under the able supervision of the Master, who himself takes a full share in teaching, is soundly carried out (Penybont Boys’ School, log book, 24 Apr 1914, EM10/11 pp.365). John Jenkins was a very experienced Headmaster. Born in Maesteg, he was 57 in 1914 and had been Headmaster of Bridgend Boys’ School for over 30 years. He was also a noted figure in the local community as Chair of the Bridgend Urban District Council and a deacon of the English Congregational Church in Bridgend. At the outbreak of war there is no doubt that he decided that his school would play its full part in supporting in the local war effort and the boys of Penybont School certainly rose to the challenge. Ever since the week ending Sept 4th my boys have subscribed weekly to some military fund or other. Up to Nov. 13th the school, including the staff, had collected a sum of £7 19s 8d and sent it to the Prince of Wales Fund. From then on to Dec 17th another sum of £2 7s 2d has been subscribed. With this money we purchased 50 shilling boxes of cigarettes and sent them to our Old Boys stationed in Scotland with the Welsh Cyclist Corps. Besides cigarettes we sent a parcel of splendid woollen mufflers and chocolates. Serg. Major Miles, to whom we sent the goods, sent a very warm letter of thanks from himself and the Old Boys for their happy Christmas box (Penybont Boys’ School, log book, 26 Feb 1915, EM10/11 p.387). The good work undertaken by the boys was not limited to raising money. To cope with the number of wounded from France and further afield, the Red Cross set up hospitals across Glamorgan. Penybont Boys’ School immediately adopted the Red Cross Hospital established at Merthyrmawr Road and from 1915 onwards sent regular deliveries of food and supplies for the servicemen. John Jenkins, as a former member of the famous Cor Caradoc, was also well known for his love of music. Under his leadership the Penybont Boys’ school choir took a leading role in local concerts organised to raise money throughout the war. Performances were not limited to choral works. As the Glamorgan Gazette recorded, the Penybont boys often included a dramatic rendition of the scene before Agincourt from Shakespeare’s Henry V. The scene was obviously a great favourite and was repeated on St David’s Day when the boys marched through the streets of Bridgend and performed for parents and the townspeople on the steps of the Town Hall. In fact there were very few fund raising activities where the Penybont boys did not shine, including their contribution to the many Flag Days held in Bridgend. The Glamorgan Gazette reported on 5 March 1915 that the Penybont boys had raised £2 5s 9d and …scarcely a person passed through any of the main thoroughfares without having a flag pinned on them. 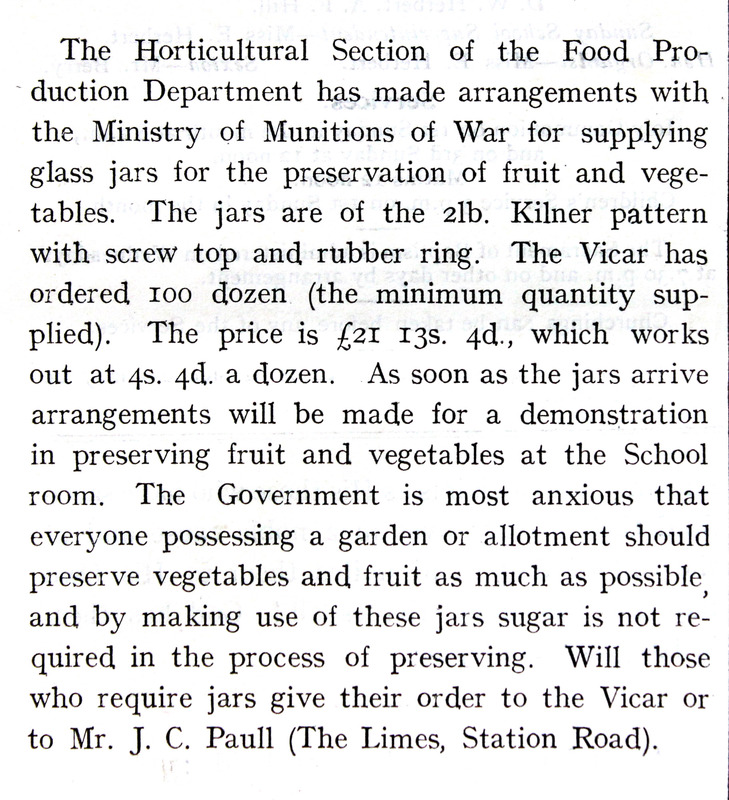 From 1917 onwards schools were asked to set up a War Savings Society to promote the purchase of War Bonds. In 1918 a number of Tanks toured South Wales as part of a national campaign to encourage local communities to purchase bonds. The arrival of the Tank, Egbert, in Bridgend, in June 1918 was possibly the boys’ finest hour. News has been received, that unfortunately it is officially confirmed of the death of two of my old scholars in the field of battle viz Willie Davis, Oldcastle and Edwin Thomas …. Other Old Boys who have fallen were Fred Thomas, Arthur Palmer and John Fitzgerald (Penybont Boys’ School, log book, 29 May 1916, EM10/11 p.422). It is not surprising, therefore, that John Jenkins and the boys threw themselves into the celebrations at the end of the war with gusto. The school was reopened he following day …with a very poor attendance. It might have been expected that this drew the boys’ war time work to an end. However, there was still much to be done not just in welcoming the troops home but also in continuing to raise money, through Bonds, to pay for the war. The War Savings campaign, therefore, continued without a break in the immediate post war years. The schools that sold the most Bonds in Bridgend were promised additional holidays. In January 1919 the John Jenkins noted. Mr Preece, the Manager’s Clerk has written to tell me that my school has won a half holiday for collecting the next highest amount per head in war Savings Certificates during the month of December. The holiday will be taken next Friday afternoon the 31 inst. (Penybont Boys’ School, log book, 24 Jan 1919, EM10/11 p.488). 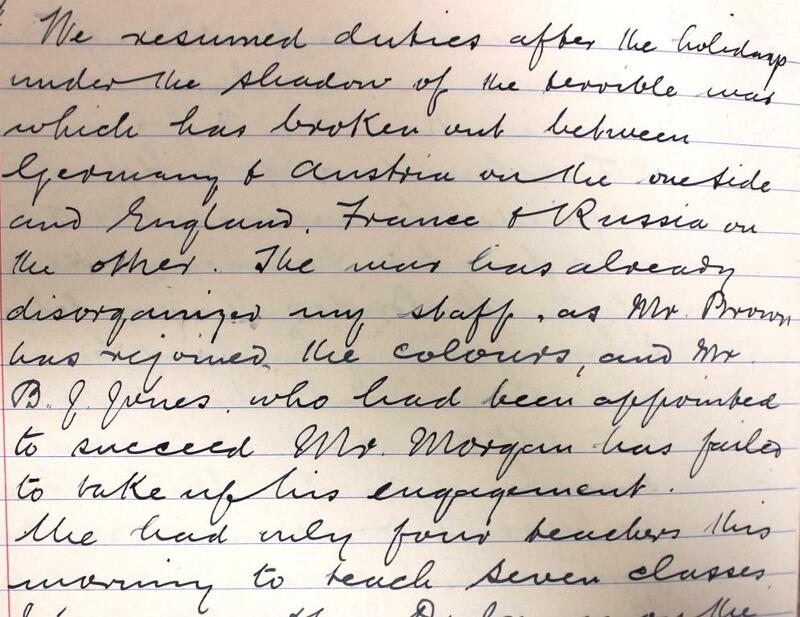 It was probably this ongoing work that led to the ‘queer request’ noted in John Jenkins’ log book from the Education Department …for particulars of any special work done by the school during the period of the war (Penybont Boys’ School, log book, 27 Mar 1919, EM10/11 p.493). This request was the springboard for the War Office’s decision to present the school with the Maxim gun as a reward for its efforts. The log book does not tell us what became of the Maxim gun. If you know what happened to it please let us know so that we can add it to the above account. 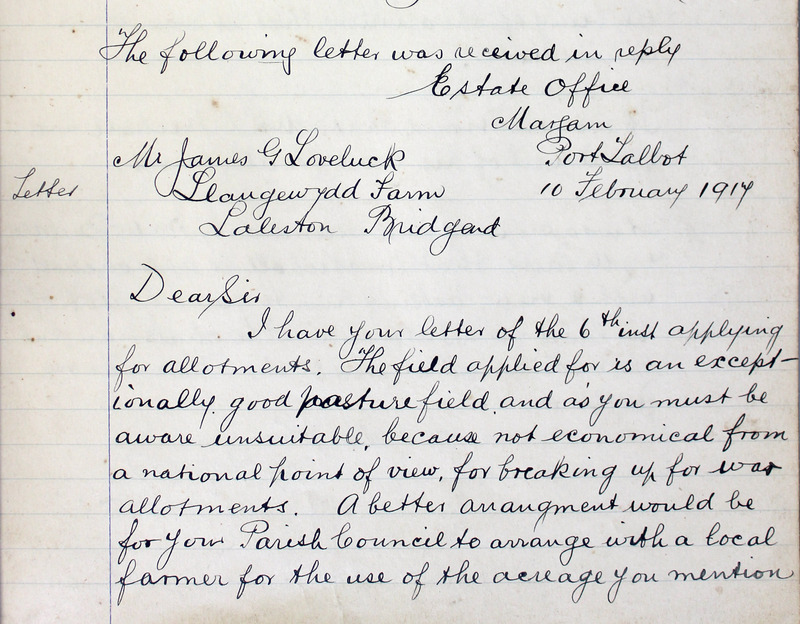 The above material has been taken from the log book of a school in the Bridgend District. Similar stories can be found in the records of schools across Glamorgan for 1914-18. If you want to find out more about the impact of the war on school life in your area and across Glamorgan you can access summaries of the school log books for each local authority area on the Glamorgan Archives website www.glamarchives.gov.uk. You can also access many of the newspapers produced in Wales in 1914-18, including the material from the Glamorgan Gazette quoted above, at http://newspapers.library.wales/. This website from the National Library of Wales provides free online access to newspapers produced in Wales.